Departures should, for all intents and purposes, be a royally depressing affair. It's the story of a cellist named Kabayashi Daigo (Motoki Masahiro) who surrenders his dreams of being a world-class musician after his orchestra is dissolved, electing to sell his prized cello and move with his wife into his deceased mother's house to take any job that pops up in the paper. What he finds is a high-paying position as a mortician, actually more of a ceremonial position called a nokan that dresses the dead for onlooking mourners, that lowers his stature in his home town and could embarrass him in front of his wife, if he'd actually tell her. Shattered dreams, reflection on the dead, and familial unrest: sounds like the components for a real downer, right? Well, Takita Yojiro's picture is anything but a downer, as it meticulously pieces humor and vibrant character interaction together into something that justifies the life-living messages within its construction. It's hard to know what to expect from Departures after our lead character and his encoffinment mentor (Yamazaki Tsutomu) discover something "unexpected" while dressing a deceased woman at the beginning of the picture, but I know I couldn't stop a few slight chuckles. That laughter's caused by a snafu at a funeral, a scene that's handled with grace and dramatic poise up until that point. Then, the tone's flipped on its head (both in that scene and with the entire film), and I couldn't have been happier with the result. Departures coasts along a slightly slapstick, slightly situational comedic breeze that knows, and respects, exactly how serious funerals can be, and the buttons that it pushes are far from tasteless. From the first second our lead character reads a misprint in the paper once the film starts its core flashback sequence -- believing the job to be something of a travel agent position for "departures" instead of for "the departed" -- it's obvious that the tone will be slightly light and cheeky. This, to its credit, is a masterful decision, because the topic's grimness can only take so much humor before it strays into repugnant territory. In fact, the balance that it strikes between humor and drama actually lends a great deal of credibility to the picture's manner. What surprises me about Departures is how incredibly funny the first half of the film can be. Most of it rests on Motoki Masahiro, who delivers a masterfully balanced performance as the lead. He's largely a facial comedic actor who conveys humor through raised eyebrows and widened eyes, something that really takes hold once he's experiencing his first days on the job. His reaction to the very first of his encoffinment duties is priceless, delivering an assault of gag reflexes and bodily jerks that'd make Jim Carrey proud. Yet, even though the material in that moment steps over into slapstick, it's never handled with any sort of falseness that takes us out of the situation. That's a testament both to the lead actor and to a calculated, sharp script from Koyanda Kundo, which sets up situational vignette after vignette in a fashion that's seamless, humorous, and touching. He's an outstanding, multilayered character that only grows more interesting with progression. The comedic setup of Departures is so brilliantly executed, in fact, that it took me by surprise when the material quickly geared towards serious reflection and began masterfully focusing on the expected dynamics between life and death, as well as around family relationships. 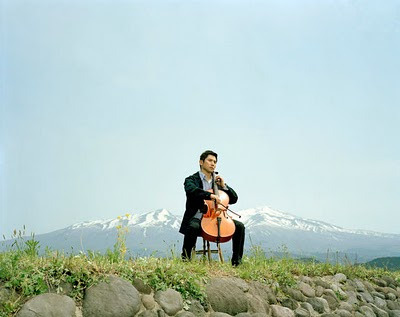 Along the way, we can pick up on the fact that there's a serious core in the picture, illustrated by Daigo's flashbacks to his childhood memories with his father and the beautiful moments where he's playing the cello in solitude. It's funny -- that scenario with a musician brooding in a corner as he strums his stringed instrument has become a bit of a cliché, but the craftsmanship behind Motoki Masahiro's performance, the sublimely shot cinematography, and the clear eye for the fabric of drama transform these scenes into excerpts of true beauty. A few foreseeable revelations take place that revolve around Daigo and his secretive job, as well as how he's keeping it secret from the people in the town that know him, and they're similarly familiar; but the times in which they occur and the effects they have on them are poignantly arranged. Takita Yojiro's centerpiece for the film comes in the intimate ceremonies, the cleansing and preparation of the dead before sending them to the next realm. Events like this, involving the careful washing and dressing of the body, have been well-documented and utilized in lore since Ancient Egypt, but many cultures have just grown accustomed to the idea of dead bodies being dirty, insanitary, and something they simply don't want to watch being handled as a final memory. That's seen by the malicious backlash that Daigo experiences when his old friends and family begin to learn of his new profession. We, as an audience, see the full gamut of gratitude and vileness for Daigo and his mentor's work, projections of sadness from loss, dissatisfaction for their work, and happiness for making their deceased beautiful for their next journey. His mentor, charmingly played by Yamazaki Tsutomu, steers him in the direction of respect about the ceremonies and away from the grotesque implications. He shapes his perception of life, as well as his understanding of the human mind about death's immediacy, by throwing him head-long into these family situations. Daigo reflects on his father because of it, the man who abandoned him when he was young. I'm reminded a bit of Cameron Crowe's film Elizabethtown, another film that tries to illustrate a man's relationship with a father that he never really understood, or knew. This film, however, shows where Elizabethtown -- charming in its own rights, mind you -- went wrong; in essence, it carries many of the same plot elements, yet the texture of the characters and the scaled-back attempts at sentiment affectively transform this Oscar winner for Best Foreign Language film into something compelling. Because of that, Departures gave me something I haven't experienced in quite a while: it made me laugh harder than I can recall from recent memory, made me shed a few tears for its emotional poignancy, and also stirred up quite a bit of thought about the film's perfectly-balanced nature regarding death, life, and family. Effortlessness becomes the reason why it's such a great film, since it doesn't forcefully push emotional buttons just to get a rise out of the audience. Just like funerals and respectful occasions for the dead should be handled, it instead rouses mirth and gloom to equal stretches while gently giving us a portrait of a person's growth through internal hardship. Don't let the premise for Takita Yojiro's film spook you, make you think it's overly macabre, or allude to the possibility of it being anything less than vibrant, because you'd be missing out on a charmingly deep and delicately poetic experience that's not even close to being as depressing or stale as it could be.